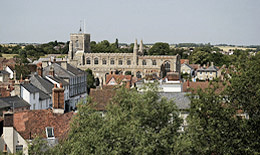 Clare is the name of a small, picturesque town on the River Stour in Suffolk, UK. It lays 21km from Bury St Edmunds and only 14km from Sudbury (Suffolk). The name 'Clare' is said to come from the 'clear' water of the Stour that flows past the Clare Antiques & Interiors warehouse and through the town. After the Norman Conquest Clare's castle was built and to this day the ruins sit upon a 70ft high motte overlooking the scenic town. The ruins also form the centrepiece of Clare Castle Country Park, which sits beside the warehouse and offers car parking to visitors. Clare Castle Country Park is a great place for a picnic in the summer and also contains the only railway station built within a castle in the UK. The station was built by the Great Eastern Railway and closed in 1967. As well as the mill in which the antiques warehouse now resides, the Castle Country Park is also adjacent to the first house of the Augustinian Friars in England, Clare Priory. Clare Priory was founded at The Earl of Gloucester in 1248 and still used as a retreat centre. Most of the interesting historical features of Clare are situated alongside the park, at the bottom of Malting Lane. There is, however, an exception. The church of St. Peter and Paul is one of the largest and most beautiful churches in East Anglia. The church sits proudly at the entrance of Clare and is steeped in history. Be sure to visit if you have time and experience the remarkable stained windows and unique ambience they create.